What are the top scary movies of all time? Well since this list is totally subjective, I’ll just give you what I think are the top ones and you can determine where they come down on your list. What makes a good scary horror movie? In my opinion it’s a movie that is riveting, that is pulse pounding, that is unnerving and that gets you really moving around, or should I say squirming in your seat. A good scary horror movie is a movie that keeps you talking years, sometimes decades after you initially see it. Alien for me was that type of movie. Alien although probably more sci-fi then it was horror; it certainly had all the elements of an excellent horror movie. Can you possibly think of anything more frightening then being trapped not just on a ship but also against the vast emptiness of outer space and being relentlessly pursued by the monster in that movie? Makes you glad you weren’t among those on the ship, doesn’t? 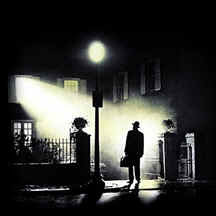 The Exorcist is if not the top scary movie on my list it certainly is one of the top scariest movies of all time. I think we would agree that if you polled 100 fans of the genre and asked them what are the top 3 most horrifying movies they’ve ever seen all of them would more than likely place The Exorcist in one of those first 3 positions. One of the things that made this movie good was its uniqueness. Because the story was based on true events it seemed less entertaining, in the conventional Hollywood storytelling sense. Not that it wasn’t entertaining, because it was, but when sitting in the theater and watching it after seeing its trailers and the previews that were many times aired on television after midnight with the knowledge that the movie is based on true events it tends to have more of a profound impact upon you therefore staying with you long after the credits roll. I can still remember as a child staying up late watching television in the dark, as I would often do when the preview for this movie came on. It scared the living you know what out of me. Not only that, every time it came on subsequent to my first time seeing it, I would quickly run to the television to change the channel. The Exorcist was so dark and disturbing that even a 30-45 second trailer airing on television was hard to view. I would seriously be remiss if I didn’t mention this next movie in our conversation of top scary movies. Halloween remains not only a cult classic but for me a personal favorite of all the many horror movies I’ve ever seen. 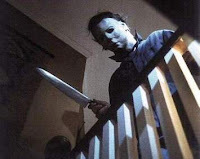 When I think of what made this movie so good and it obviously was a number of factors but for me it was the unbelievable portrayal of Michael Myers by Nick Castle. John Carpenter seriously made you believe that if the “Boogie Man” were to ever take on flesh and come to life his name would be Michael Myers as played by Nick Castle in Halloween. As our discussion of the top scary movies comes to an end I want to speak briefly about another movie that continues to stand the test of time as one of the greatest horror movies ever and that being A Nightmare on Elm Street. Although this movie provided a good 90 minutes of escapism for me and others, at least from an entertainment standpoint, it was however unsettling, in that it demanded that each of us examine one of the unfortunate realities of life and that being our own eventual death. At every horrifying turn in the movie Wes Craven relentlessly reminds us, through his brilliantly developed main character Freddy Krueger (portrayed by Robert Englund) that whether asleep or awake, young or old, rich or poor we are hopelessly incapable of evading death when it eventually does comes for us. For me my only solace is knowing that when it comes knocking at my door, Freddy Krueger won’t be standing there.